What kind of a country is Lebanon and what kind of music do you think would come out of it? It's a country full of ancient archaeology, awesome mountains and popular in winter. A hot and steamy country, it possesses a beautiful coastline suitable for lazing on the beach; a war-torn land as many will recall from thirty years ago. These issues are the subplot, as it were, of this disc's booklet notes by Thorsten Preuss. The eclecticism can be heard in the music by composers whose names will be entirely unknown to almost all western European musicians. For this reviewer, up until now, the only Lebanese composer who has really emerged is my friend Bechara El-Khoury who now lives in Paris. To highlight these contrasts go no further than the last track Toufic Succra’s Variations on an Oriental Theme and compare it with Hotaf Khoury’s Third Piano Sonata. The former could have been written two hundred years ago. It's an early work, his opus 2, and is clearly classical, almost a student exercise and of little individuality. The theme does not seem especially oriental to me; in fact it’s little more than a simple children’s song. The latter work, the sonata, which is subtitled Pour un Instant perdu (For a lost moment) falls into three movements. The language is of our times, mixing a sort of Middle Eastern modality with atonality and intense chromaticisms. In the process it uses textures and techniques which are startling and bold. The middle movement entitled Le temps suspend is remarkably ‘glassy’, reminding me of the French composer Tristan Murail. The first (Hasard) is full of tight and unrelenting counterpoint and last (Quête - translated I think as ‘quest’) is more wild and rebellious but evocative of vast, wasted spaces. It made a considerable impression on me. 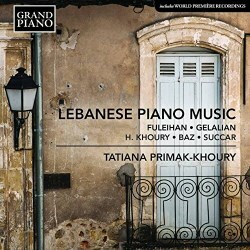 The Lebanese pianist Tatiana Primak-Khoury has found a way of capturing the character of each work and getting the best out of the music. In this she is helped by a vivid yet spacious recording. Some of the pieces are technically very challenging as for example the Canzona e Toccata by Boghos Gelalian. I was quite surprised to read in the booklet that his music is ‘uncompromisingly modern’. This piece is intensely chromatic and, in the Canzona, inflected with Middle Eastern melodic turns and ornaments but it’s exciting to listen to. Gelalian is said to have worked whilst his surroundings were being bombed and destroyed. As a child his family had already sought refuge from their original Armenian home escaping the Ottoman genocide. Gelalian was not a man give up on his new homeland. This piece was composed during the period of the civil war. However the Tre Cicli are more rugged with abrasive rhythms in the virtuoso outer movements. The gentler Adagio in between is ambiguous in tonality but exquisitely atmospheric. The piece that I most returned to is the opening Piano Sonata No. 9 by Anis Fuleihan. His autobiographical profile is somewhat different. He was born in what is now the Turkish part of Northern Cyprus. In the 1920s he made an intensive study of Lebanese folk music. From 1953 to 1960 he was head of the Beirut Conservatoire and later moved to America where Stokowski premiered some of his orchestral works. This sonata opens with a Calmo con serinta which alternates spikier passages with more lyrical ones. To add to the mix the Lento second movement seems rather French, the language most Lebanese can speak well. The brief third movement, which acts as a scherzo, appears the most Lebanese to me with its pounding rhythms. The fourth movement, a Presto, had touches of Stravinsky or Bartók. A truly cosmopolitan work then but one which definitely articulates a personal language. There is an even stronger French influence to be heard in the Esquisses (Sketches), seven miniatures by Georges Baz. He lived half of his life as a bank manager and half as a teacher at the Beirut Music Conservatoire. As a young man he had studied in Siena where he also worked in a bank. His pastoral style is most attractive and amongst the titles in this little work are Mon ami Makoto Shinohara (a piece dedicated to the Japanese composer) and the hot and sticky Une soir libanaise. As you may have gathered I have much relished the pieces recorded here. I would advise anyone with an ear for the unusual to search out a copy. There is much to discover and it will certainly make this reviewer look out for more music by these fascinating and little known men of Lebanese music.